AKKA Technologies announces a first half of 2017 perpetuating the good results achieved in 2016. While improving its margins in line with its 2018 strategic plan, the Group confirms its capacity to grow faster than the Technology Consulting sector. The improvement was achieved thanks to the successful transformation of the France business unit and the first positive impacts of a similar plan initiated in Germany at the end of 2016. At the same time, the German business unit accelerated its diversification, bringing its revenue to a level equal to that of France in the first half of 2017, a year ahead of the 2018 target. - The Group generated revenues of €666.5 million in the first half of 2017. This represents an increase of 21.1%, with organic growth of 8.1%. Organic growth was strong in each of the Group’s three business units in the first half: +7.9% in France, +8.8% in Germany and +7.4% globally. - Operating profit from ordinary activities increased by 32% to €41.5 million (€31.4 million in the first half of 2016). The operating margin from ordinary activities rose by 50bp to 6.2%. The improvement is attributable to the continued increase in margins in French operations and to the early stage margin improvement in Germany. - Operating income has totalled €29.9 million (+14%) after taking into account non-recurring expenses of €11.6 million, mainly related to the implementation of the Management Incentive Programme and the acceleration of the reorganisation of the German BU. - Adjusted consolidated net income increased by 25% to €21.3 million, representing 3.2% of consolidated revenue. The Group’s consolidated net income has totalled €17.4 million, compared with €17.1 million in H1 2016. - Cash flow amounted to €41.1 million in the first half, an increase of 57% compared with the first half of 2016. The DsO are under control at 59 days, compared with 66 days in H1 2016. Generally negative in the first part of the year due to seasonal trends, operating cash flows were negative €14 million, compared with negative €11 million in H1 2016. - Net debt is under control, taking this seasonal trend into account, and after payment of dividends and the three acquisitions made in the first half. It was €222 million as of 30 June 2017, compared with €141 million of end-June 2016. Gearing was 93%, and the Group’s available cash amounted to €138 million. The AKKA Technologies Group has confirmed its ability to outperform the Technology Consulting sector. Its consolidated revenue increased by 21.1% to €666.5 million in the first half of 2017 (+22.3% in Q1 and +20.0% in Q2). Market share gains were driven by a 20.3% increase in the headcount. As of 30 June 2017, the Group had 14,916 employees, compared with 12,394 at the end of June 2016, 13,252 at the end of December 2016 and 14,578 as of 31 March 2017. Their geographical breakdown is as follows: 6,739 in France, 4,630 in Germany and 3,547 worldwide. With revenue of €277.3 million, France delivered stellar economic growth* of 8.7% in the first half. These market share gains were accompanied by an improvement in the BU’s operating performance. The French operations recorded an operating margin from ordinary activities of 7.0%, vs 6.0% in H1 2016. Including recurring subsidies, the margin was 9.5%. The French operations also stand to benefit from continued growth in the automotive, aerospace, rail and life sciences sectors, and from their recruitment momentum in the second half. 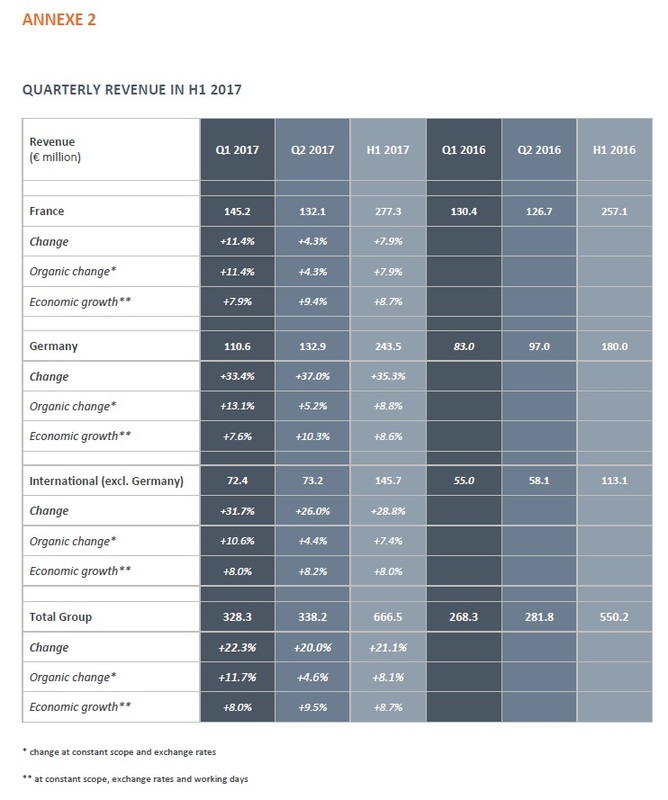 In Germany, revenue increased by 35.3% to €243.5 million in H1 2017. Economic growth was at 8.6% (7.6% in Q1 and 10.3% in Q2). The acquisitions of Erlkönig in 2016 and Gigatronik in 2017 have strengthened AKKA’s positioning in digital technologies, while increasing the diversification of its geographic footprint and customer base. Q2 confirmed that the Group is now a key player with German OEM ecosystem. Operating profit from ordinary activities increased by 89% to €15.3 million (€8.1 million in H1 2016). 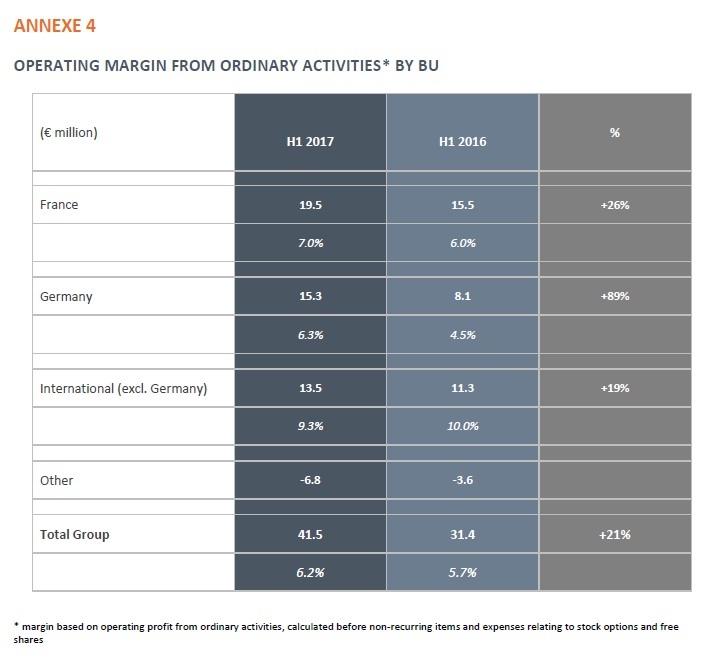 The operating margin from ordinary activities rose by 180bp to 6.3%, reflecting the first positive effects of the ongoing transformation in Germany. 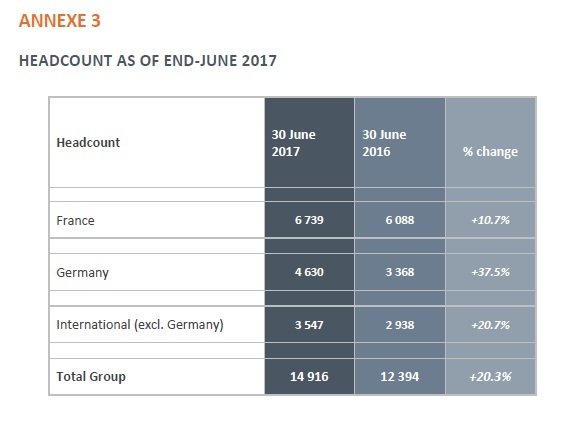 The Group’s International operations (excluding Germany) posted revenue of €145.7 million in H1 2017, an increase of 28.8% compared with H1 2016. Economic growth excluding Oil & Gas was 12.4% over the half-year. Having reached critical mass in Belgium, Italy, Spain and the Czech Republic, AKKA Technologies has stepped up its investments in order to sustain its growth in those countries and to achieve critical mass in its other countries. In view of these investments and the temporarily dilutive impact of the Oil & Gas activities, international activities generated a recurring operating profit of €13.5 million in the first half (€11.3 million in H1 2016), representing an operating margin of 9.3%. - The excellent first-half performance allows the Group to raise its 2017 growth targets: the Group is now anticipating organic** revenue growth above 5% in 2017, combined with a further improvement of its margins. 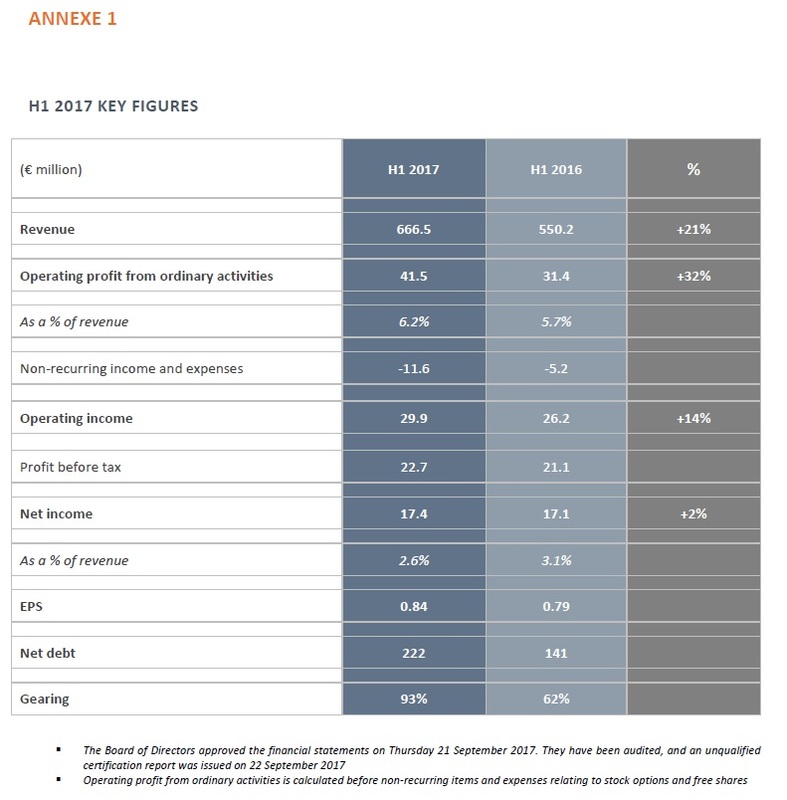 - The successful achievement of the transformation in France, the diversification in Germany and the maintenance of high margins internationally will enable the Group to exceed its 2018 revenue targets and deliver an operating margin from ordinary activities*** between 8% and 10%. - AKKA Technologies enjoys unique positioning allowing it to support its customers to meet the challenges represented by Industry 4.0 trends. The portfolio of skills and the Group’s international exposure around its Franco-German pillar set the stage for the next strategic steps in its development.